I love this book, set in Montana in 1919, it's full of wonderful characters and beautiful writingEvery book lover should read it for the library scenes alone! “If America was a melting pot, Butte seemed to be its boiling point,” observes Morrie Morgan, the itinerant teacher and inveterate charmer who stole readers’ hearts in The Whistling Season. A decade later, he steps off the train and into the copper mining capital of the world in its jittery 1919 heyday. While the riches of “the Richest Hill on Earth” may elude him, once again a colorful cast of local characters seek him out. Before long, Morrie is caught up in the clash between the ironfisted Anaconda Mining Company, radical “outside agitators,” and the beleaguered miners. As tensions build aboveground and below, Morrie finds a unique way to give a voice to those who truly need one, and Ivan Doig proves yet again why he’s reigning king of Western fiction. Often called the dean of writers about the American West, Ivan Doig is the author of such national bestsellers as The Whistling Season and The Bartender's Tale. His work has been translated into Spanish, Japanese, German, and Finnish, and his honors include seven regional booksellers awards, the Evans Biography Prize, and the Wallace Stegner Award, among others. He lives in Seattle. "A genuinely sweet book by a writer who is generous to his characters and readers alike...start to finish Morrie proves a character in the best sense of the word...He's awfully good company...a character with whom it's a pleasure to pass the time no matter the scenery." "Entertaining for its rich historical take on the town of Butte...and for its evocative descriptions." "A classic tale from the heyday of American capitalism by the king of the Western novel." "As enjoyable and subtly thought-provoking a piece of fiction as you're likely to pick up this summer. It's a book that can be appreciated just for the quality of the prose and the author's adherence to the sturdy conventions of old- fashioned narrative or for Doig's sly gloss on Western genre fiction and unforced evocation of our current condition - or, better yet, for all those things...One of this novel's pleasures is the rich cast of secondary characters Doig effortlessly sketches into his narrative...a pleasure to read." "Relax and allow yourself to be re-absorbed into a way of life that is, day by day, being lost to strip malls and strip mining...As in his previous novels, Doig excels at his descriptions of both characters and the land. ..It's hard to keep a smile off your face as you're working your way through this book. Nostalgia has found a happy home here." "If you were looking for a novel that best expresses the American spirit, you'd have to ride past a lot of fence posts before finding anything as worthy as Work Song. "Not one stictch unravels in this intricately threaded narrative ... infectious." "Readers who fell in love with Morrie Morgan in The Whistling Season will welcome him back to Montana in Ivan Doig's latest adventure. The pages turn quickly ... Doig's love of language - more specifically, storytelling - is apparent throughout. ... Richly imagined and beautifully paced." "With deft strokes of storytelling, Doig paints a vivid scene. [He] introduces ... the most unforgettable librarian in all of American fiction [among] a reach of characters worthy of Dostoevsky. ... Doig has delivered another compelling tale about America, epic as an Old West saga but as fresh and contemporary as the news." "Another insightful, highly readable look at the landscape of the land and the soul...[Doig's] masterful hand takes readers skillfully into the past with a human story that echoes today ... a true treasure." "Magical ... you'll be enjoying every bit of [Doig's] breathtaking storytelling prowess." "More atmospheric, pleasingly old-fashioned storytelling from Doig...whose ear for the way people spoke and thought in times gone by is as faultless as ever." "The most tumultous, quirky, and fascinating city in the American West of the last century has finally found a storyteller equal to its stories. 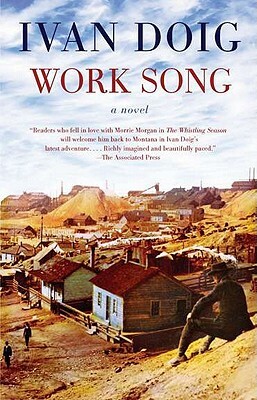 ... Ivan Doig brings to life the core of humanity, and a hell of cast, amidst the shadows and sorrows of Butte, Montana -- a city that could say it never slept well before New York made a similar claim." "Butte is by far the most colorful town in Montana, a kaleidoscope of culture, commerce and copper mines, the perfect palette for an artist like Ivan Doig. Work Song doesn't just hum along-its rich authenticity echoes and resonates."